Arthur Dixon was born in Lancashire, but soon moved to Scotland where his father played for St Mirren, Rangers and Cowdenbeath. His goalscoring record of 89 goals in 178 games ranks as one of the best at Queen's. After leaving Queen's, he played with Clyde and Hearts, then moved back south to play with Northampton Town, then onto Leicester City and Kettering Town. 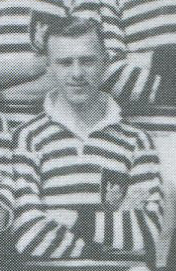 A broken leg brought an end to his playing career, and he returned to Glasgow where he died in 2006, age 84.